Well, there is definitely too much of that sentence, but you can see what he’s getting at. 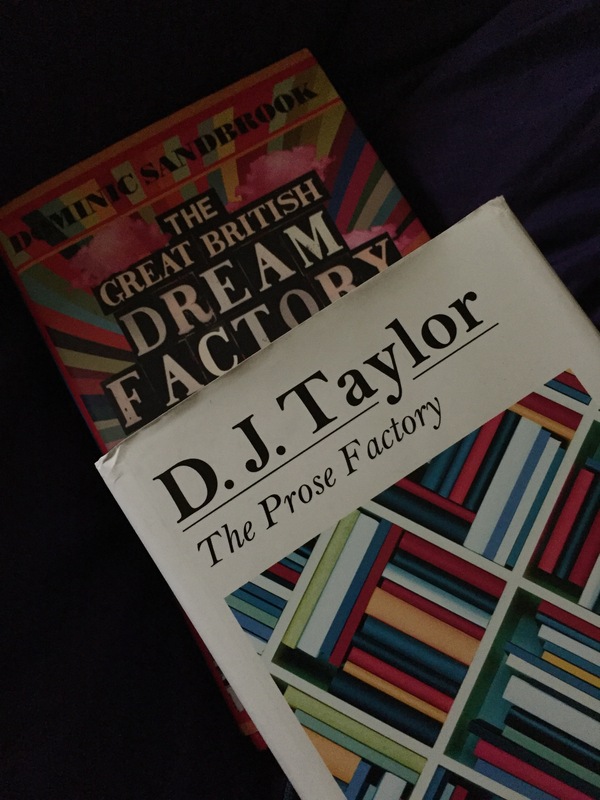 It comes towards the end of D J Taylor’s The Prose Factory, which covers the history of English literary affairs and business from 1918 through to roughly present day. It is full of ideas about writing, the business of writing, and by that I mean both the often neglected financial side, and also what writers were really concerned with, as opposed to what they said they were concerned with. There is a great section on the rise of what was known as “the middle article” – light essays on literature or culture more generally in newspapers from roughly the 1920s onwards. Such articles were still common in British newspapers when I became a junkie in the mid-1980s – or at least the broadsheets such as the Telegraph, the Guardian, the Observer and the Sunday Times. The ‘middle article’ became the vehicle for maintaining liberal values just as, in the political sphere, the liberal tradition became threatened. Essayists as diverse as GK Chesterton or AG Gardner or JB Priestley kept this tradition going – a tradition which included the attitudes of universality tolerance and diversity of subject matter. One essayist is described by Taylor, delightfully, as reviewing James Joyce’s Ulysses from ‘the angle of one who suspects that Ulysses has merit but can’t quite see it himself’. This got me thinking about the blogosphere because… Well of course it did. Back when blogs became a thing, about a dozen years or so ago, I likened them to the old 18th and 19th-century pamphleteers: partisan, often puerile, and occasionally very personal. There has, in the past few years, developed a sort of second wave of blogs in New Zealand (and no doubt elsewhere) which is less concerned with politics and more with wider issues. There is still a highly political element, but it manages – a fair amount of the time, anyway – to avoid the juvenile and extremely boring ‘Ya Boo Lefties! ‘Ya Boo Righties!’ face pulling behaviour which became synonymous with blogging for a long time. I think this “middle article” style seems not a bad description of the second wave. Taylor is good – very good in fact, if very acerbic – about the sheer snobbery of many writers, with those espousing radical politics being the most snobbish of the lot. The chapter on the 1930s – “The Pink Decade” points out that champions of working class amongst the intelligentsia seldom admitted actual members of the working class to their salons and that when they tried things seldom turned out well. There is a heartbreaking anecdote of Sid Chaplin, one of the few working-class writers,who was published being invited to George Orwell’s house and making it as far as the doorway before fleeing in terror. He also has the occasional go at the more anti-intellectual tradition of English letters, but points out that even this, once upon a time, could draw on a background of shared cultural and intellectual heritage. The mid-20th Century battleground between ‘modernists and traditionalists, of highbrows and lowbrows, of middle-class reactionaries, as Orwell once put it, thanking God they were not born brainy…’ was real enough, but, as he says, even conservative critics of T S Elliot’s ‘The Wasteland’ could pick up the classical allusions. That isn’t so now. There is, perhaps naturally, quite a bit on two writers who have written a lot about writers: the two friends who were often mistaken for each other, Malcolm Bradbury and David Lodge. And that brings us to the issue of literary theory which haunted the study of English when I was at university in the late 80s and which was one of the main reasons I steered clear of an English major. I figured if I was going to do political theory I would rather have the real thing. And here we go full circle, back to the snobbery of the Bloomsbury-ites and their fellow modernists. There is a thorough and by no means one-sided discussion of critic John Carey and his attack on modernism, post-modernism, structuralism, post-structuralism, and literary theory generally, and Taylor does conclude that all too often 20th century literature has acted for minorities and elites to the exclusion of a large potential of readers of ordinary intelligent people who have developed, over the years, thoroughly understandable dislike of ‘culture’ and the ‘cultured’. Great Britain has lost an empire and has not yet found a role. The attempt to play a separate power role — that is, a role apart from Europe, a role based on a ‘special relationship’ with the United States, a role based on being head of a ‘commonwealth’ which has no political structure, or unity, or strength — this role is about played out. So spoke former US Secretary of State Dean Acheson in the early 1960s. Acheson was of course discussing foreign policy, and the comments came at the time the British government was edging towards joining what was then called the European Economic Community and which we now know as a European Union. And of course we also now though British voters opted to leave Europe last month, even if we – and they – still don’t quite know what that vote means. Acheson almost definitely did not have in mind the kind of role Dominic Sambrook outlines in The Great British Dream Factory. That role is as a kind of middlebrow entertainer to the world. Books, true, play a sizeable part in this role. Sandbrook is though more enamoured of film, television, and music – a chapter on the country house is more interested in the film and television examples than the literary ones. Brideshead Revisited certainly features, but Sandbrook is more interested in the 1981 television series than the original Evelyn Waugh novel (not one of Waugh’s best efforts, in my view, but still). While P G Wodehouse and Agatha Christie get a look in, it is the global phenomenon of Downton Abbey which really generates Sandbrook’s enthusiasm. Spies – he seemed rather taken with James Bond – and science fiction such as The Prisoner and Doctor Who are also star products of his Dream Factory production line. While I’m sympathetic to Sandbrook’s rejection of some of the overrated cultural icons it covers, he tries a little too hard and too self-consciously to be a kind of middlebrow, plain-man iconoclast (he rates Elton John over David Bowie, to take one example). His book lacks Taylor’s elegance and above all Taylor’s penetrating wit. While Taylor’s study – admittedly with a slightly narrower focus – is surefootedly deft, deep, and occasionally droll, there is a sense of clumsiness, over striving for effect, in Sandbrook’s work. Both are worth a read. But Taylor’s is the one I will read again. Posted on July 29, 2016 July 30, 2016 by Rob HoskingPosted in Anglophilia, Blogging, Book Review, books, British Empire, Civilisation, History, WritingTagged Bloomsbury, books, D J Taylor, David Lodge, Dominic Sandbrook, Downton Abbey, DR Who, Evelyn Waugh, George Orwell, James Bond, John Carey, Kingsley Amis, literature, Malcolm Bradbury, P G Wodehouse. ‘…there are the politicians, and the priests, the ayatollahs and the economists, who will try to explain that reality is what they say it is. Never trust them: trust only the novelists, those deeper bankers who spend their time trying to turn pieces of printed paper into value, but never pretend that the result is anything more than a useful fiction. 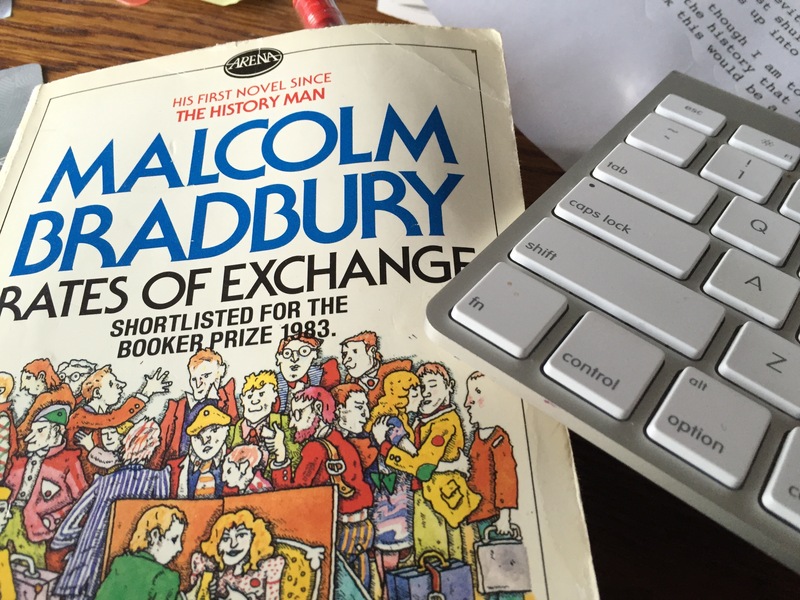 Posted on April 23, 2016 by Rob HoskingPosted in books, Litrachure, WritingTagged books, Malcolm Bradbury, Rights of Exchange, thought for the day, writing.